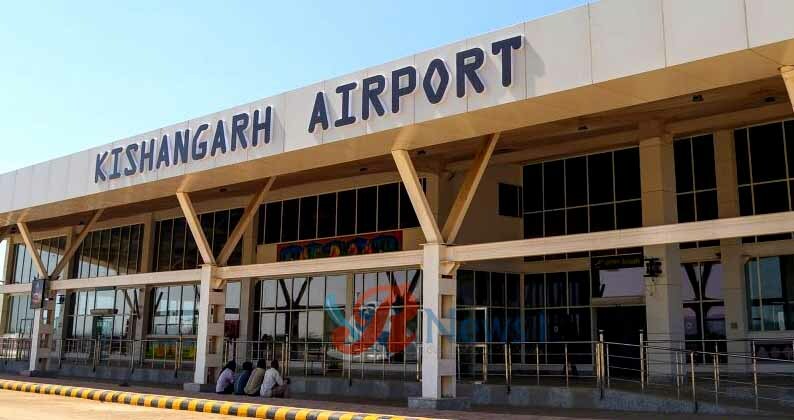 Jaipur : Chief Minister of Rajasthan, Vasundhara Raje and Union Minister of State for Civil Aviation Jayant Sinha, on Wednesday, Inaugurated the Kishangarh Airport near Ajmer. The airport with modern facilities designed at a cost of Rs. 145 crores. CM Raje said that long-awaited dream of the residents of Kishangarh and Ajmer was coming true today after decades. She said that she visualised this project during her previous tenure, which got realised only now. For this, she thanked Prime Minister Narendra Modi and the MoS Sinha. CM said that with functioning of this airport world-renowned marble industry would get a boost. Also, the pilgrims and tourists visiting religous town of Pushkar and the Dargah of Khwaja Moinuddeen Chishti at Ajmer would be at ease. She said that those attempting to take credit of this airport must know that they only laid foundation of this project before the elections in 2013 to write their names on the stone, but no further progress was made. Raje said that her government not just laid foundations, but finished the projects. She said that Kishangarh Airport was not one example, foundations were laid for Parvan Irrigation Project of Jhalawar and Barmer Refinery as well, but now her government was making progress on these projects. The MoS Civil Aviation Sinha congratulated the CM for start of operations at Kishangarh Airport. He said that her timeless and sincere efforts could make this possible. After technical survey and testing, very soon Kishangarh-Delhi flights would also be started, he added.